There's something at once desperate and hopeful about a junk shop -- the setting for David Mamet's play American Buffalo. Call those discarded items on the shelves a man's potential and those hidden treasures his dreams, and you get an idea of how things play out in the current Vermont Theatre Ensemble production. The story of small-time crooks itching for a big score, the drama is classic Mamet, full of sketchy characters bedeviled by their own bad judgment. One of the playwright's first major works, American Buffalo today offers an intriguing, retrospective look at the bold stylistic strokes that have come to define his theatrical voice since the 1975 premier. In the hands of a skilled cast, it's easy to see why his work can be so riveting. "The shot," to sum things up in Mamet-speak, is this: Junk shop owner Donny is planning to rob a customer's home with the help of Bobby, a kid who hangs around the shop. The customer, who does not appear on stage, is a coin collector Donny suspects fleeced him on the purchase of a buffalo-head nickel. Donny wants his nickel back -- and whatever valuables he and Bobby come across in the guy's house. When a fellow neighborhood low-lifer named Teach blusters into the shop, fuming about an insult he has just suffered at the local diner, he gets wind of Donny and Bobby's scheme -- and wants in. To complicate things, he wants Bobby out. He says the kid's inexperience and drug habit make him a liability. The story unfolds like many Mamet "mysteries," with the dramatic tension gathering not around the heist but the preparations leading up to it. This approach leaves the characters' goals forever dangling, carrot-like, at the end of a proverbial stick. 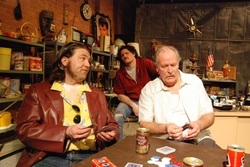 The fun of this play comes from watching the characters ponder and plan how to nab the prize, all within a junk shop magnificently cluttered with old vacuum cleaners and dusty trophy fish as envisioned by director Michael Jordan Evans and Jim Evans. Like most Mamet scripts, this one is powered by a dialogue style hewing to its own unique sense of how people speak. Mamet's characters parrot one another, interrupt one another and often employ an insular dialect drawn from the play's setting. This is why mediocre productions of his work can come off as stilted to the point of bizarre. This production soars above that, presenting a story about so much more than losers getting in their own way. As Teach, John D. Alexander is the story's driving force. He is a volatile character, at once the cocksure master of his fate and a man easily wounded by personal slights. He energizes the junk shop with his menacing swagger and officious diatribes, sporting porkchop-sized sideburns, greasy hair and the garish attire one associates with men who make their living at the dog track. To his credit, Alexander also evokes the essential humor in Teach's character. He's an operator, and it's amusing to watch him insinuate himself into the deal. He's also a moralist, though his moral compass just happens to point in directions that serve his interests. It's simply a blast to see Alexander take on this challenging role, walking a razor-thin line of emotional, psychological and financial pain. Dennis McSorley's Donny offers just what Teach needs: a good listener who won't be pushed around. In spite of what Teach may think, Donny is the brains of the outfit -- that is, in McSorley's portrayal, he appears to have at least some control over his emotions. McSorley offsets Alexander's vitriol with a welcome sense of calm as he shuffles about the junk shop, contemplating the next move. Donny is hardly wise, however, and his switch is flipped when he thinks he has been taken advantage of, or when Teach broaches subjects that Donny has ruled off limits -- namely, Bobby's drug abuse. McSorley brings nuance to his role, presenting Donny as something more than a doormat for Teach to walk all over. The chemistry between McSorley and Alexander is engaging and convincing. They are two sides of the same coin -- American Dreamers flipping heads one day, tails the next, stuck in a cycle of "buffaloing" and being "buffaloed." In this rough-and-tumble world, Bobby arguably pays the highest price. Aaron Masi plays him as perpetually uncertain, jittery and anxious to leave the junk shop for business dealings elsewhere. His is the smallest role in the play, but for those moments when he is on stage, Masi's Bobby adds to the dramatic tension by referencing other crooks who might have their eye on the same prize. Masi's strongest moments are near the end of the play, when his problems -- everyone's problems -- catch up with him. If Teach is the driving force of this drama, Bobby is the canvas upon which its deeper meanings are drawn. It's a commentary on loyalty, morality and life on the margins. Whether or not one enjoys David Mamet's hallmark hand-to-hand conversational combat, he has emerged as an eminent stylist of the contemporary American theater. To wring such a crackling sense of realism from his 30-year-old script for American Buffalo today is a notable achievement. There is no doubt that Evans and his cast understand the playwright's intentions -- and clearly know what they're doing as well.